As the middle child of five children growing up in rural Oneonta, Alabama,I assumed that on any given day, every mother loaded her gaggle of kids into the family Volvo station wagon to go antiquing. Even as a six year old, words such as retro, majolica, Chippendale, Eames and other terms rolled off my tongue as easily as bicycles, Barbie dolls, and basketballs. My two older brothers (the real troublemakers in the car) finally became of the age where they could stay home alone and skip the “boring shopping”. This left my younger brother and sister taking orders from me since I had been elevated to “front-seat” prominence where I reigned at my mother’s right hand until I finally got my own car. I actually began to look forward to these outings scouring the countryside looking for antiques for Mama's booth at Hannah Antiques in Birmingham. Some of the shop owners even gave us free cokes, kittens, and keepsakes (which I still cherish). Our cuteness and good behavior more often than not secured Mama a good deal on items that she purchased. Since we had to be Mama's eyes so she could concentrate on driving, we were instructed to look for antique wicker, metal gliders, and shell-backed chairs on porches and in yards. We played along as if it were a game. If we spotted one, she would pull into the driveway and ask the owner if they were interested in selling some or all of it. Sometimes we scored big and other times we were unlucky (or just shooed off). By about age 11, I began to have definite likes and dislikes of her treasures. She had a passion for antique wicker and I liked the cool metal gliders. My affinity for them has only grown. Since I work seven days a week, I have to rely on my pickers to search high and low for my beloved gliders. As you can tell by the pictures, no glider is off limits. Even though they have been weathering in people’s yards since the fifties, most are in remarkably good shape and can be sand blasted, painted, and brought back to life. 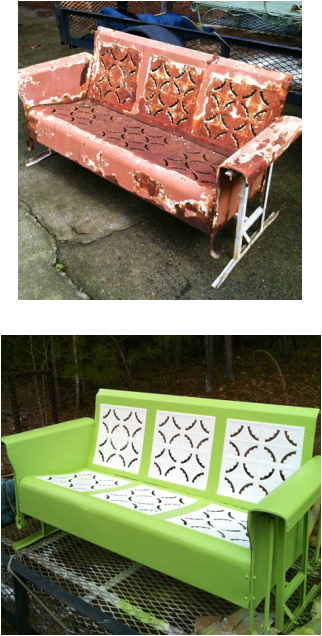 I love researching their fifties colors so I can do them justice when I refurbish them. It is truly a labor of love for me. One of the highlights of my day is looking out my shop window and seeing someone in a glider or shell-back chair. Immediately, I have the urge to serve them a tall glass of sweet tea, just as Mama would if they were visitors in our home. Being born in the eighties as I was can’t be nearly as much fun as being a child of the fifties. From the choice of paint colors to the black and white saddle shoes, I’m enamored. Plus, I often think if I was a child of the fifties, I’d be a young adult in the sixties, and that would have rocked too. To all of you grown-ups out there: I envy your existence in this magical era of fantastic design and I thank you for leaving treasures from your past behind so that they may become my present.